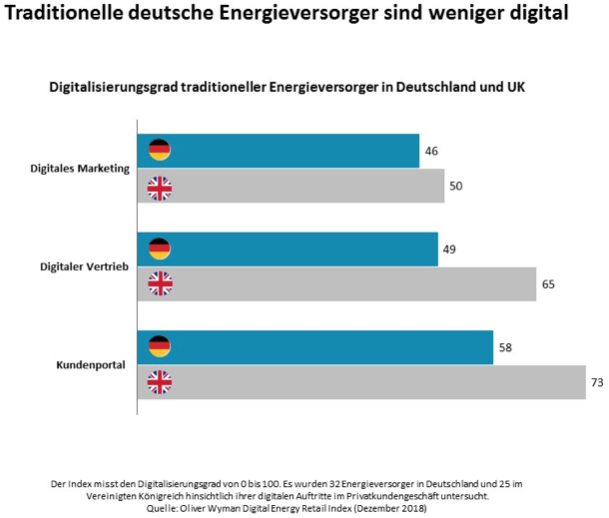 For the Digital Energy Retail Index, consultants from Oliver Wyman analyzed the digital maturity of British and German utilities with regard to consumer communications. Pleasing to us: some pixolus customers are quite well ahead – among them Vattenfall with ENPURE and Yello with kWhapp. The study shows that only half of the potential is realized in Germany. British utilities are already a bit further along. The comparison was based on 81 criteria and 141 measurable data aspects. These three core tasks were identified: Digital marketing, digital contract conclusion and portal functionality. In all three categories, British suppliers performed better than German providers. Among the best performers, the EnBW subsidiary Yello shines with its convincing customer app kWhapp. The Vattenfall offshoot ENPURE with an intuitive contract conclusion route and functions such as camera-based meter reading is also right at the top. Both Yello and Vattenfall rely on the pixometer counter scan function developed by pixolus in their apps – the pixolus team is proud to support the two top placed with pixometer for playful handling and user-friendliness. Traditional British utilities succeed better than German providers in trumping new competitors in all disciplines. The management consultants conclude: “Those who offer modern, digitally-supported customer interaction increase their chances”. Oliver Wyman sees a great need for action at many municipal utilities; once their business was secure because the customer relationship was not questioned, now more agile providers are pushing into the market. The willingness of customers to switch is increasing noticeably. In the age of Apps, Alexa & Co., the more informed customer is now expecting more contemporary standards of service. Digital attackers are more likely to react to the demanded flexibility. Tech giants such as Google and Amazon are also discovering potential for themselves. The same applies to non-sector companies such as Deutsche Bahn with its own power supply offer.